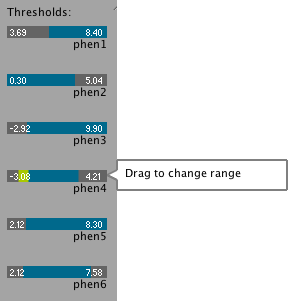 Thresholds can be set for phenotypes, if the user desires to limit the number/height of connections that are being displyed. The thresholds are set for the gene-associated values in the dataset. Upper and lower thresholds can be modified, such that the user can define a range of gene values for each phenotype. As an example, one would set thresholds in order to display only highly/lowly expressed genes in the same pathways.